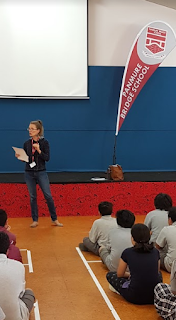 It was great having Rachel coming back to Panmure Bridge School to inspire our students to take part in this year's Winter Learning Journey. Ms Kirkpatrick and Mrs Anderson are looking forward to reading all the blog posts from LS2 as they take in the virtual sights on their 'Great Kiwi Road Trip'. I too love watching all the holiday blogposts! Enjoy your winter holidays and keep up the blogging. Click here to access our LS2 class site. Click on the 'blogging' button to make connections with our learners and their learning.